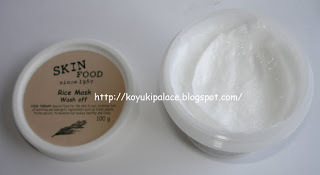 Skinfood's Rice Mask is one of the most popular masks in the brand. It contains a lot of rich nutrients, vitamins and minerals. Back in the ancient times, rice/ rice water were used by females to wash their face. Not only can rice water wash away the oil on the surface of the skin, it also leaves behind a mild and gentle feeling. Rice soothes sensitive skin, prevents dark spots from forming on the surface, and provides a whitening effect. Instructions: Apply a thick layer onto clean damp skin, massage onto skin lightly (sensitive skin do not massage). Leave on for 10-15 mins and wash with warm water. 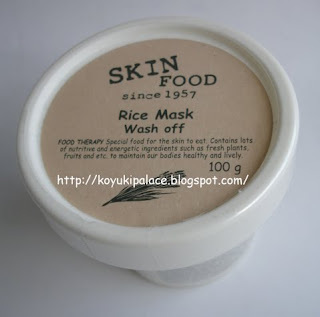 My skin feels soft and moisturized, but the whitening effect is not obvious... the rice mask is creamy with bits of rice in it, so one can probably use it as a gentle exfoliator while washing it off. The smell is fresh but also smells ricey. Compared to other Skinfood masks, the Skinfood Rice Mask works ok... blackheads on the nose weren't visible, but the ones buried deep inside the nose would probably require a bit more assistance. It's quite moisturizing, good for winter.